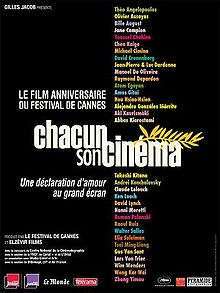 To Each His Own Cinema (French: Chacun son cinéma : une déclaration d'amour au grand écran) is a 2007 French anthology film commissioned for the 60th anniversary of the Cannes Film Festival. The film is a collection of 34 short films, each 3 minutes in length, by 36 acclaimed directors. Representing five continents and 25 countries, the filmmakers were invited to express "their state of mind of the moment as inspired by the motion picture theatre". The film's subtitle reads "a declaration of love to the big screen". To Each His Own Cinema premiered at the 2007 Cannes Film Festival on 20 May and was televised on the same night in France on Canal+. David Lynch's contribution, Absurda, was not ready in time and was instead shown before Wong Kar-wai's My Blueberry Nights on the festival's opening night. Two DVD versions of the film are available, both Region 2: one released by StudioCanal on 25 May 2007, the other released by Pyramide Distribution on 31 October 2007. World Cinema by Joel and Ethan Coen is not included on the StudioCanal DVD nor listed on the Pyramide DVD. David Lynch's Absurda is also not present on the StudioCanal DVD. ↑ Jacob, Gilles. "To Each His Own Cinema, The 60th Anniversary Film of the Festival de Cannes". Cannes Film Festival. Retrieved 2007-12-28. 1 2 McCarthy, Todd (20 May 2007). "To Each His Own Cinema". Variety. Retrieved 2007-12-28. ↑ James, Alison; Gray, Timothy M. (16 May 2007). "Cannes rolls out red carpet". Variety. Retrieved 2007-12-30. ↑ "Chacun son cinéma – DVD – StudioCanal" (in French). StudioCanal. Retrieved 2008-01-01. ↑ "Chacun son cinéma" (in French). allocine.fr. Retrieved 2008-01-01. ↑ Thompson, Anne (31 May 2007). "Chacun Son Cinema". Thompson on Hollywood. Variety. Retrieved 2008-01-01.